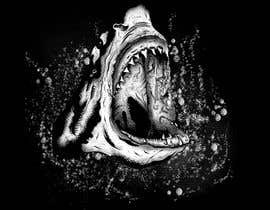 A design of a great white shark emerging from the water, like a shark attack. Design should be single color so it can be used for screen printing. I have posted an example design. This design is not to be copied or used in any way, it is just an example of what we are looking for. File handover should include both a png with transparent background, and vector format if possible. Please provide progress sketches to prove your original artwork. WE WILL BE SELLING THIS DESIGN ON TSHIRTS AND WILL OWN 100% RIGHTS TO THE DESIGN, SO THERE IS TO BE NO PRE-MADE CLIPART OR ELEMENTS USED FOR THIS DESIGN. DESIGN SHOULD BE 100% ORIGINAL DESIGNED FROM SCRATCH. Any designs using clipart will be rejected and reported to freelancer. Anyone stealing another artists design will be reported to freelancer. We have had problems with this in the past and do check this. please don't close this contest until end of time. looking for something close to the example pic. Dear sir, can we design, with free ai files from freepick or other websites, that contains same image?